This Product typically ships within 3-7 business days of the order date, but may require up to 2-4 weeks. This processing time is in effect regardless of the shipping method selected at checkout. This Product typically ships within 4-7 business days of the order date, but may require up to 2-4 weeks. This processing time is in effect regardless of the shipping method selected at checkout. 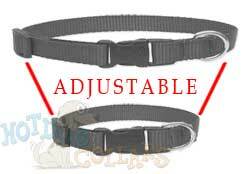 I measured my dogs neck and ordered the proper size, but be aware they run a little large and I had to shorten them almost to the end of their adjustment. Also, the stitching should be up against the left buckle, but it's centered, so when you shorten the collar, the buckle attachments and slides hide a lot of the stitching. Other than that, they look great. Good quality collar and stitching was exactly as expected. Took off two stars because it is barely reflective. Tiny little reflective areas don't do much of anything. If you are looking for a collar that will help your dog be spotted at night this is not it. If you want the non reflective collar this is perfect. Cute, but collars way too big for a small. Had to adjust it and when I did you couldn't see the name. Also, the name of dog should be visible around neck so you can read it. The way this is designed, the name is underneath because the hook to attach leash is on top. This is the 6th embroidered collar we have purchased from Hot Dog Collars over the years. They are wonderful. My dogs have always found a way to remove each others hang tags. It is a game to them. Just knowing that my phone number is always with them is comforting, and was useful when my curious terrier took off on his own!